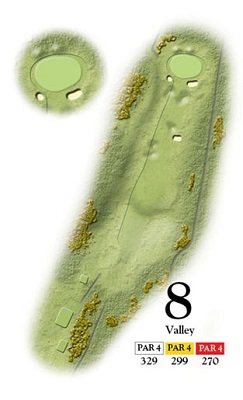 A directional change as you come towards the end of the front nine. This hole runs in the opposite direction to the previous holes. A tee shot slightly left of centre avoids the fairway bunker to the right, your approach must miss the two deep greenside bunkers to a very shallow green that slopes left to right, usually a short iron here, making this hole a good birdie opportunity.